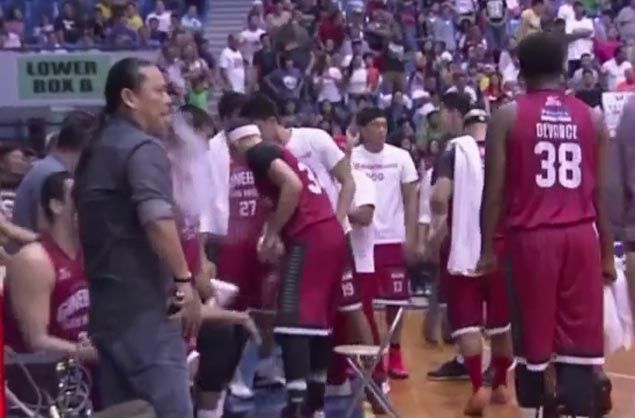 Ginebra Alfrancis Chua lit up a furor when he was caught on national television using an e-cigarette on the bench during a game against Blackwater at the AUF gym in Angeles City. ANGELES University Foundation (AUF) officials are far from happy after Ginebra team governor Alfrancis Chua violated the school's anti-smoking policy inside the campus that hosted a PBA road game between Barangay Ginebra and Blackwater last Saturday in Angeles. According to a school official, AUF has sought the intervention of the PBA Commissioner’s Office, through deputy commissioner Rickie Santos, regarding the incident inside the AUF gym that was caught on national television. In an interview with Spin.ph, AUF director for university relations Tere Paras said school management was offended with the action considering their university has long been against smoking of any kind. “We don’t condone smoking in our university. As a matter of fact, we have been a longtime advocate of anti-smoking. We don’t allow smoking of any form inside our campus,” she said. “We are saddened by what happened, but the university maintains its stand against smoking inside our premises. We regret that it happened, [at] kung nakita namin, we would have reminded him of that,” added Paras, who revealed to Spin.ph of Santos’ assurance that the PBA will look into the matter. “Nag-usap na kami ni Mr. Rickie Santos kahapon. He will let the PBA media bureau handle it daw. I am not sure kung ano ang plano nila, pero nakausap na namin siya kahapon. Naipakita niya 'yung video and although hindi evident sa video na nag-puff siya, 'yung smoke, nakita. Sabi niya (Santos), siya na ang bahala run,” said Paras. “Sila na ang bahalang gagawa nun, importante naipaabot naming sa kanila na may nangyaring ganyan, nailagay in a bad light yung event, yung project, and the school,” Paras said. While PBA officials remain mum about the issue, Philippine Sports Commission (PSC) chairman Ritchie Garcia emphasized the issue should not be ignored by the pro league. “Masama ‘yun eh. It’s not proper to smoke on the court and inside any sporting venue. The area of competition is supposed to be sacred and cigarette-free,” said Garcia. "Tunay man na sigarilyo o e-cigarette, hindi pwede yun." “The PBA is not under my office but I will try to talk to their commissioner and even my fellow officials from the Games and Amusement Board (GAB), si Chairman Ramon Guanzon, kakausapin ko rin, because they should write (the PBA) a very strong letter regarding this,” he added.